Saute the onions in oil until softened. Then add the garlic and rice, mix to coat, and fry lightly for a minute. Pour the coconut milk and water over the rice and allow it to start warming. Then add the stock cube, pepper, and paprika. Combine it all well and simmer over very low heat, stirring occasionally, for about 20 minutes uncovered. If you need to add more water or time to get the rice softened, go ahead – you don’t want crispy rice here! When the rice is just about done, stir in the brussel sprouts so that they are just wilted into the rice. 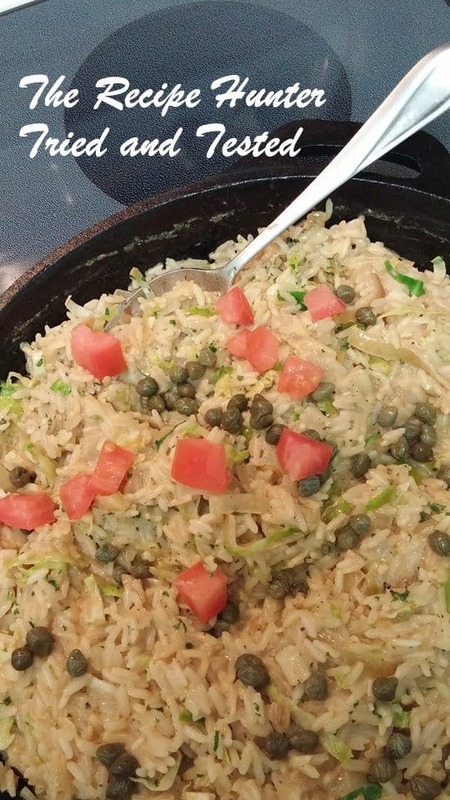 Sprinkle the capers over the top. Meanwhile, fry the seafood in oil with salt, pepper and a few drops of lemon juice. Don’t overcook, but get some color on them. It really helps to have a great big pan so that they don’t end up boiling in their own juices. Serve the rice with the tomatoes for a very liberal fresh garnish and top with seafood (not in the picture – we ate it too fast!). This one is a showstopper! !